Building on the success of Hexic HD, Hexic™ 2 brings all-new pieces to the board and a new multiplayer mode, so you can compete with friends in your living room or over Xbox LIVE®. The basic gameplay is straightforward, familiar, and addictive—just spin a trio of hexes to create a group of three or more matching colors, or build a formation of hexes to create more advanced pieces. Whether you want a relaxing puzzle break or a frantic race against the clock, Hexic 2 has you covered! 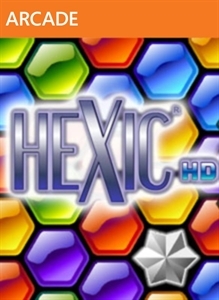 Acclaimed developer: Hexic 2 is another challenging puzzle hit from Alexey Pajitnov, the original creator of Tetris®. New challenges: All-new special pieces, different formations, and modes keep Hexic 2 challenging even for the veteran Hexic player. Multiplayer competition: Amp up the gaming excitement playing multiplayer on the same console or over Xbox LIVE (up to two players) in Battle Mode. Easy to learn: The gameplay is straightforward, approachable, and highly addictive. Stunning visuals: The game is rendered in full 3-D with stunning special effects such as reflections, glow, and spectacular highlights. The classic card game makes its way onto the Xbox Live Arcade. UNO® is the classic party card game that's number one for family fun! Compete against three other players to match colors and symbols, go Wild with special command cards such as Skip and Reverse, and be the first to play all your cards. Add-on theme decks offer new art an..